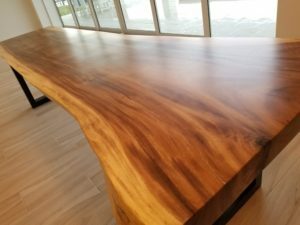 Finally the perfect piece was found for our friends in north Ft. Myers of a 10’ long live edge table. This slab traveled all the way from Indonesia and made it to the US with a few dings and imperfections. Jesus Tables sanded and finished the slab to perfection ready for heavy family use. 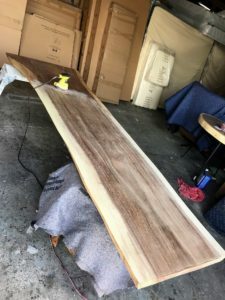 The live edge table is made of solid 3” teak and was cut from a solid tree (it was not pieced together from two smaller trees). Hard to find long and wide slabs from a single tree. But if you do, lucky you they’re beautiful. 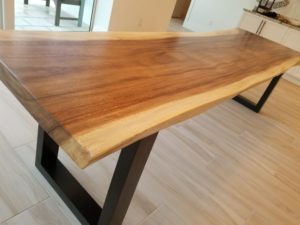 Our friends in Ft Myers wanted thick metal legs to compliment the table, but to not take too much away from the beauty and focus away from the top. 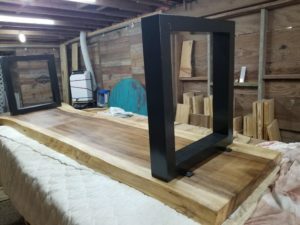 The legs were positioned to dining height and it was good to go. Now the live edge table is ready for decades of family gatherings and extended use. These tables literally last forever. 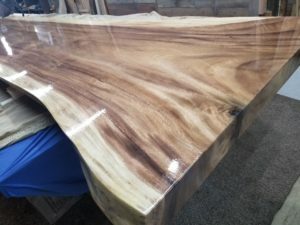 Especially for the live edge slab being so thick and big. It was a lot of fun working on this large awesome slab.